At any hour of the day or night, we in the first world can flip a switch on the wall, and have light to see, to read, to cook, to do homework, to work, to send emails and surf the web, to deliver a baby or do a life-saving surgery. Most of the developing world is without power and there are no switches. There is darkness that causes a lack of education, inability to perform work, and even death. 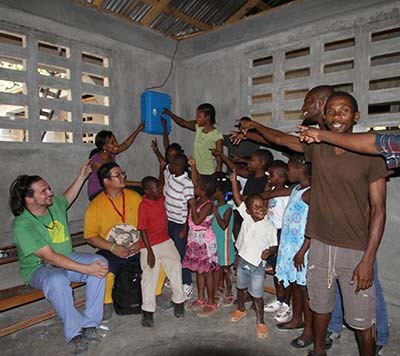 On a trip to Haiti in the spring of 2012, I escorted three Worldwide Orphans (WWO) Board Members to Kenscoff, Haiti to learn more about our programs. One of the most shocking parts of that trip was the realization by my fellow travelers that children in the orphanages in Haiti were living without light. "How can they read and do their homework?" was a simple and shocking question asked by Andrew Allen of Florham Park, New Jersey. He was outraged -- as we all were -- that the children were living in such deplorable conditions. Worldwide Orphans provides education, medical care, and psycho-social support to thousands of orphans in five countries, and this week five "solar suitcases" were delivered to Toussaint Louverture airport in Port-au-Prince and two were deployed in orphanages, Les Amis de Jesus and Coeur de Compassion, where WWO does programming for orphans. We Care Solar, based in Berkeley, California, was co-founded by Dr. Laura Stachel, an obstetrician, and her husband, Hal Aronson, an energy engineer, because Laura witnessed the tragic results of lack of light to manage cesarean sections and surgical procedures in Nigeria in 2008. I met Laura on a panel at Yale's yearly Global Health Conference and then I met Gigi Goldman, an Advisory Board member of We Care Solar, through a supporter of WWO, Isabella de la Houssaye Crane. Gigi attended a session I led about the Toy Libraries of WWO and she conspired to provide the suitcases for the orphans we serve in Haiti. This is just one of the many knitted partnership tales in my life in international development. Solar suitcases for maternal health care is the mission of We Care Solar and now they have non-medical solar suitcases through "We Share Solar" co-directed by Hal Aronson and Gigi Goldman, that can provide light for orphanages, schools, and libraries. Simeon Gant, a member of the Executive Board of Directors of Green Tech, along with Laura Walters who works with Solar Energy International (SEI) and Alan Jensen, a retired high school teacher in Monterey, California, trained high school and community college students how to construct solar suitcases that will be sent to Africa and Haiti to provide light for humanitarian services. Green Tech is a not-for-profit that teaches underprivileged youth green technology, enabling them to be employed in the future. I am very proud to report that WWO's Y2C (Youth Connecting with Children) team members, Marc, Jacqueline, and Correlus led by our Program Manager, Melissa Willock, underwent a practical training program provided by Solano Community College in California, to install the solar suitcases and to maintain them over time. The miracle of light will change the lives of hundreds of orphans in Haiti, allowing them to read and learn and be successful in school. The orphanages in Haiti are notoriously dark, dank, dirty and uninhabitable by gorgeous, bright, and eager Haitian babies. The light will make their faces shinier and their hearts less sad. The connection of Laura, Gigi and WWO were destiny. Stay tuned for more on this project as Hal Aronson and Gigi Goldman work with Green Tech and others to build this program in youth technology training here and internationally. I would love to see this team take this capacity building program to help youth acquire the skills to learn to build green power grids in their own countries for economic strength and independence. Please check out this video for the Solar Care/Green Tech story.